"This is a smallish mod that adds some useful blocks"
TubeStuff is a "smallish" mod which adds several really useful blocks. At first the name TubeStuff was just temporary, but as the mod got bigger, popular mod developer, Immibis, decided to keep that name. The mod adds a variety of blocks that, besides being functional in their own right, also act to transition between BuildCraft, RedPower 2 and other similar mods. TubeStuff adds several new blocks which make existing BuildCraft and RedPower 2 systems more flexible and compatible. 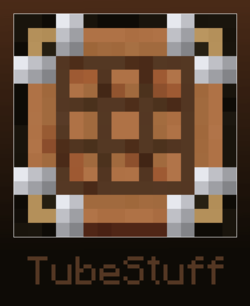 Buffer (TubeStuff): A block which allows easy transition between pipes and tubes. Black Hole Chest: A chest with infinite inventory. Incinerator: A block which permanently destroys any items that enter it. Duplicator: A block which duplicates items inside of it. Retrievulator: This is like a RedPower 2 Retriever but also works like Regulator. Block breaker: A block which acts like a player breaking a block and also takes durability from a tool/item placed in it, unlike some which have infinite durability.